Whether it’s to track the progress in your fitness regimen, or to ensure you don’t relapse, or to even alter your mood, wearable technology like the FitBit and Thync are a growing trend that’s projected to expand to the billions of dollars within the next few years. Wearing these objects on the wrist or head can get a bit cumbersome after a while, especially when they aren’t made to be ergonomic enough to be worn for long periods of time. That issue may be altogether eliminated with on-skin wearable technology that would allow people to navigate their devices, right from their arm, for instance. 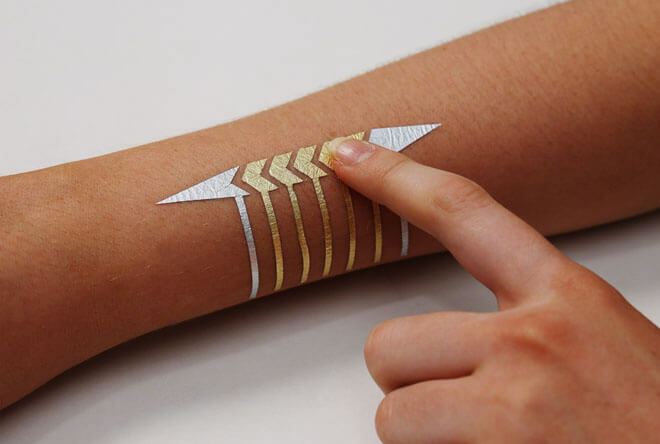 Researchers at the MIT Media Lab have come up with a novel and affordable alternative called Duoskin, a wireless electronic user interface that can be temporarily attached to the skin like a stick-on tattoo, and is cheaply made out of off-the-shelf materials available in any craft store. The team’s fabrication process involves first sketching out the design, using graphic design software to finalize the eye-catching geometric designs for these customized circuitries. 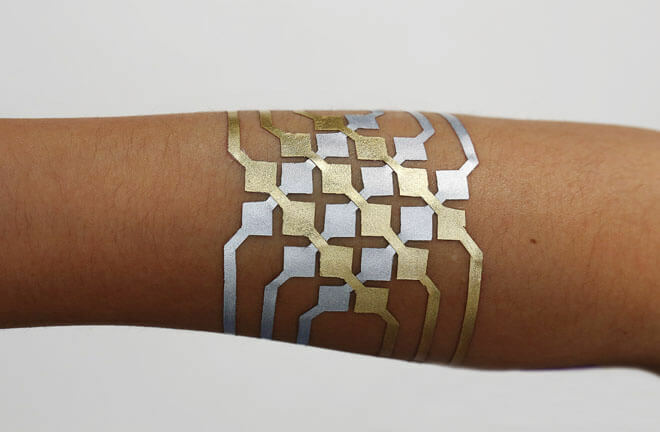 The stencils for the circuitry of these on-skin interfaces are created using layers of non-toxic, silicone-based tattoo paper and vinyl film – all of which can be cheaply obtained from any craft store. These are then cut either by hand or with an inexpensive electronic cutter. 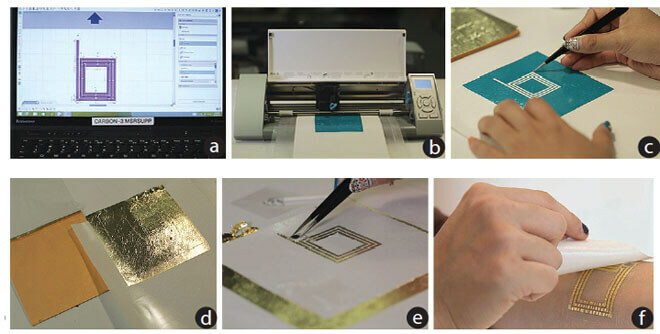 Conductive materials like gold and silver leaf are then adhered on top of this silicone-vinyl sandwich, Electronics are then mounted on the surface of the gold leaf, and another layer of thin tattoo paper added on to adhere the circuit to the skin using a water transfer process, much like how conventional temporary tattoos are usually applied. Three different versions of the wearable prototype were produced. The first class consists of an input sensing device that’s similar to the conventional user interfaces that we are used to, such as buttons, sliders, and two-dimensional trackpads — all condensed into an attractive, on-skin interface. The layering of materials apparently prevents electric charges from the user’s skin from interfering with the precise, capacitive measurements needed to get the interface running correctly. For instance, in the team’s experiments constructed functional music controller interfaces using the DuoSkin platform. The second class is a “soft display” on the skin that utilizes heat-sensitive thermochromic pigments that will change color according to skin temperature, to create a simple display that may not have mind-blowing, high-resolution graphics, but could do something simple like change color to show how someone is feeling, like a mood ring plastered on the skin. Both of the first two classes used Arduino Mini microcontroller to process sensor data, and a rechargeable battery to power them. Wireless communication devices make up the third class of epidermal interfaces. 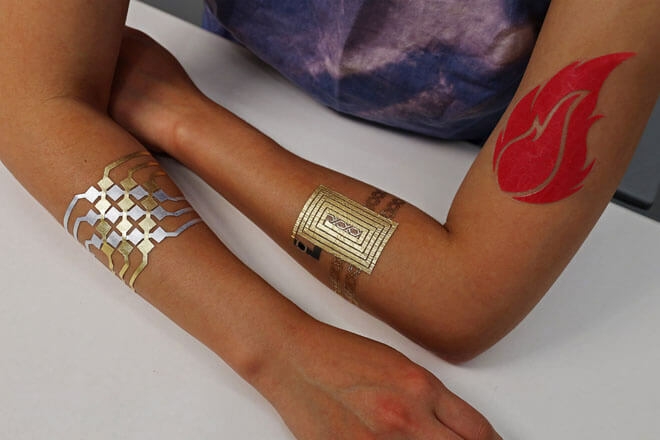 Data is exchanged using near field communication (NFC) protocols, with the DuoSkin device transformed into electronically readable ‘tag,’ consisting of a coil antenna of sorts that’s connected to a chip. Unlike the other two versions, these tags are passively powered and have no processor to speak of per se. 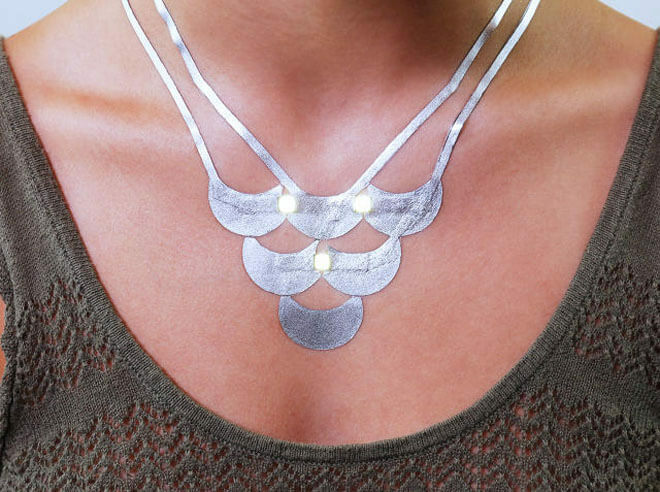 Besides these three classes of on-skin interfaces, the team also developed DuoSkins that were purely decorative in nature, experimenting with complex designs that could be printed with inkjet printers, and attaching energy-efficient lighting to create a “LED skin necklace” that can light up to create a dazzling new kind of jewelry. There are a lot of possibilities here to further push the evolution of wearable devices. Unwieldy medical monitoring devices may eventually give way to soft, truly wearable wearables that would cost pennies to make at scale. But perhaps the most intriguing factor is that these intuitive and unobtrusive interfaces can be customized and designed by the users themselves, according to their tastes and needs, something that they can’t do with other mass-produced gadgets. To top it all off, it’s got a bit of flashy allure to it, pointing to a potential future where device interfaces may be comfortably attached to our skin, rather than worn on the wrist.